Much of the Highlands of Scotland consists of moorland. This can be defined as the great treeless wastes covering the mountain sides as high up as the limit of the heaths. This limit, which may be as high as 3,000 feet, must not be taken too literally, for at this height we are entering the region of alpine vegetation and many alpines are to be found well below it. Therefore, we will confine the moorlands to those areas where the heaths attain their finest development, that is up to about 2,000 feet. Besides the mountain areas that are vast areas of moorlands covering the great sandy moraines of Speyside, and the other sandy morainal areas which occur in most of the larger valleys. There are also the huge upland plateaux such as the Moor of Rannoch, which are covered with huge stretches of heather and deep treacherous bogs. Most people are acquainted with these great sweeping moors where the wind whistles eternally among the heather stems. Dull and monotonous at most seasons except when the heather transforms them into a blaze of colour, they have a charm and beauty of their own. The haunts of loneliness where the curlew whistling from his bogs, the chattering of a noisy burn or the hoarse cry of some lone bird of prey alone breaks the silence. Regions that invite the walker to explore their remotest corners and yet are full of treachery, especially in the autumn and winter when the snow-laden gales sweep across them with unbroken fury, or the mists obscure the treacherous bogs and morasses. Most of the Scottish moorlands are composed of soil containing a large peat content caused by the dampness of the soil. But in Speyside there are large areas of moorland covering dry, sandy soil which dries out so quickly that only xerophytes vegetation such as heaths, broom, etc. can exist. There are few people who have not been struck by the beauty of the moorlands when the heather transforms them into a blaze of colour. The purple moors sweep up the mountain sides and along the valleys covering the land with a purple mantle on which the tarns and lochs shine like brilliants. The honey-scented air is full of the hum of the millions of bees who come from far and near to this banquet table, so rich in honey, whose flavour is not excelled by that from any other plant. What delightful memories the heather bring back to me! Tramps over the heather-covered hillsides where the brown grouse fly out from beneath one’s feet with a whirr of swift wings, and the proud red deer regard from a distance the disturber of their sanctuary. Delightful days spen in Speyside where the heather moorlands mix with the dark pine forests, lakes and rivers to form scenes of unsurpassable beauty, or among the wild Western Isles where the purple heather runs down to the blue Atlantic, turning scenes of barrenness and austere grandness into scenes of loveliness and unmatchable colour. 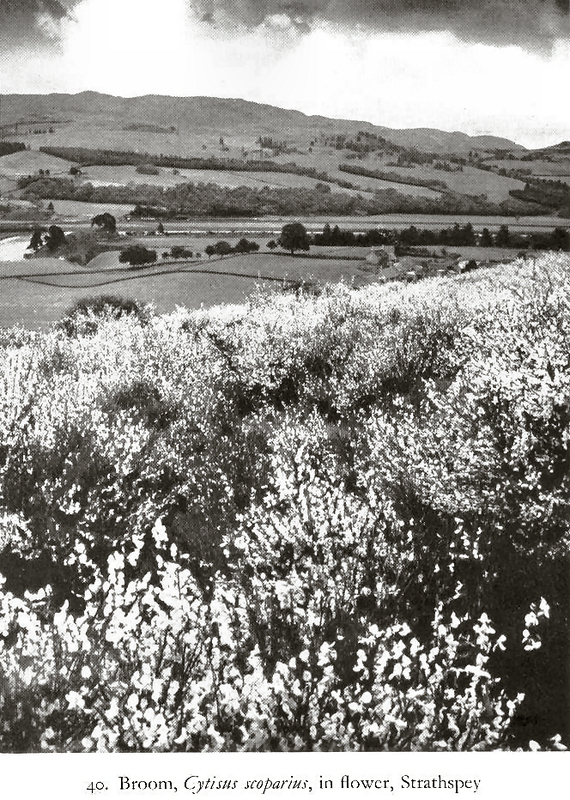 But although many must have admired the beautiful scenic effects made by the heather blooms, how few there are who can distinguish the individual species which are classed together as heather, and how few know how wonderfully they are suited to these habitats and what are their wonderful arrangements to ensure fertilization. 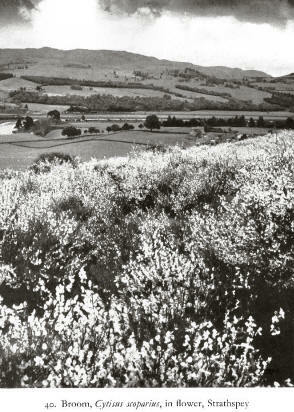 The heathers of our Scottish moorlands are composed of three species, two of them Erica cinera and Erica Tetralix, being members of the great Erica genus of which so many are cultivated as ornamental shrubs in our gardens and conservatories, and Calluna vulgaris, an allied species which is the flower usually known as the heather. The moorlands where the heathers grow have a covering of peat. Peat is the result of accumulating vegetable matter and is formed in those places which are cold and damp, and in which decay is a slower process than in warmer situations. On the moors this layer of peat is very thin owing to the sparse vegetation which covers them, for plants such as heaths contribute little vegetable matter to the soil. As the vegetation slowly decays organic acids are liberated which give the soil an acid reaction. This acid property of peat makes it unsuitable for many types of vegetation. This results, firstly, from the fact that the acids acting on nitrogen compounds in the decaying vegetation release the nitrogen as free ammonia which is given off into the air, and into nitrogen salts which are quickly washed out of the soil. Thus the soil of the moors is lacking in nitrogen. Now nitrogen is vital to the welfare of plants, and as plants depend on almost the whole of their nitrogen supply from the soil via the roots, it stands to reason that plants growing in soils lacking nitrogen must adopt other methods of obtaining it. Thus among the inhabitants of the moors and bogs, we find parasitic plants, insectivorous plants and others that keep colonies of bacteria and sometimes fungi in nodules of the roots to fix the nitrogen for them. In the heaths certain species of fungi live in the roots. They are able to fix the nitrogen of the air in the soil and make it available for the plant to use. In return the fungi obtain certain vital products from their host. This mutual help is know as symbiosis. Thus has Nature enabled these plants to conquer the sterile regions which would otherwise be almost desert. The Bell-Heather is a very wiry, small shrub from one to two feet high, but in exposed or very dry situations it may not attain one foot. The stems are tough and not easily broken, and give rise to leafy shoots which are terminated by the flower spikes. The leaves themselves illustrate admirably how nature adapts plants to their environment. The Bell-Heather, growing as it does in dry exposed situations where the perils of drought are ever present, could not have survived if it had continued existence without adaptation. The leaves are dark green in colour, and shiny, and arranged in whorls, in the axils of which are small leafy shoots. As most people know, the breathing pores of most leaves are situated on the lower surface and from them water vapour escapes from the leaves. It is vitally important to the bell-heather that too much water does not leave the stomata, so it has rolled the edges of the leaves inwards until they nearly meet, leaving a groove between the two opposing surfaces. Thus the stomata are protected by the inrolled surfaces of the leaves. But in order to make even more sure Nature has covered the under surface with fine hairs which completely block the groove and other spaces by which water might escape. The flower of Erica cinerea are also very interesting and merit a detailed study. The flowers, which are a bright purplish-red in colour, are arranged in spikes at termination of the branches, and are very conspicuous. Each flower is a delightful little object, the petals being welded together to form a base-like structure about a quarter of an inch long, surmounted by four narrow lobes. At its base are situated four very inconspicuous green sepals, whilst within we find the round ovary surmounted by a fine style which projects beyond the corolla mouth. From the base of the ovary spring eight stamens, which arrive at the mouth of the vase but do not project beyond it. Their anthers, which are pressed close against the style, each have two horn-like projections, which effectually close the mouth of the flower. As the nectarines are situated under the ovary creeping or short-tongued insects cannot obtain the nectar, which is reserved for the long-tongued bees and butterflies. When a bee arrives at a bloom it grips the lobes with feet and pushes its tongue into the vase. On so doing it cannot fail to touch the horns on the anthers, which are immediately jerked up and throw the pollen over its face and head. On visiting another flower it must leave some pollen on the stigma at the entrance. It is impossible for the pollen from the same flower to be deposited on the stigma. This plant, which has a rather hoary appearance and is very beautiful, is not quite so abundant as the other heaths and is usually found in damper situations. The leaves, which have a fringe of hairs, are arranged in whorls of four around the stems and are not as revolute as in E. cinerea. The flower themselves are of a delicate, pale pink hue and are arranged in an umbel at the termination of the branches. They are very beautiful, looking as if modeled in wax, and they smell very strongly of honey, which aids in making them more conspicuous. The tube of this flower is slightly longer than in E. cinerea and may be one reason why the hive-bees are not so partial to it, humble-bees and butterflies being the flowers chief visitors. 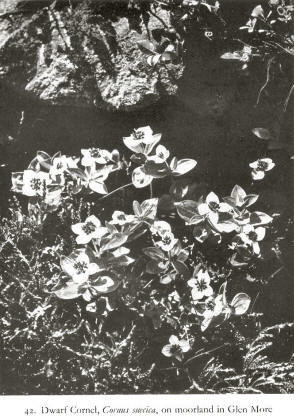 This plant, whose habit is much the same as that of E.cinerea, is one of our most abundant British flowers and covers large areas of mountain sides and moorlands. The whole plant is much more leafy than in the other species and the very revolute, small leaves are imbricate on the branches. The flowers, which are a bright pink in colour, and are arranged in very dense spikes, are very conspicuous and smell fragrantly of honey. The flowers, themselves, are differently constructed from those of the Ericas. The petals form a wide mouthed bell, which is very small and almost hidden by the petal-like calyx, which is the most conspicuous part of the flower. Owing to the shallowness of the bell, the nectar is easily accessible to all flying insects, and for this reason the moors in August hum with the myriads of insects which come to partake of the bountiful feast so easily obtainable. Hive-bees are the chief visitors, but many other short-tongued insects are to be found around the flowers, as well as humble-bees, Syrphidae-flies and butterflies. Certain plants impress themselves upon us, not so much by the individual beauty of their flowers, but by the combined effect of their millions of blooms colouring the whole landscape. Such plants are the heather which throws a purple mantle over the mountains in August, the buttercup which spreads a cloth of gold over the meadows in May, the hawthorn with its billows of snowy blooms, and the broom which turns Speyside into a valley of gold in June. The Broom is a beautiful plant when thus seen in all the glory of its youth; seen in autumn or early spring in its an untidy, rather unattractive shrub with its long, green, slender twigs rising like a shock of uncombed hair from the main branches. It is what is known as a xerophyte, i.e. a plant which is constructed to live in dry, windy, exposed places. We have already met some xerophytes in the course of this chapter, the heaths being good examples. 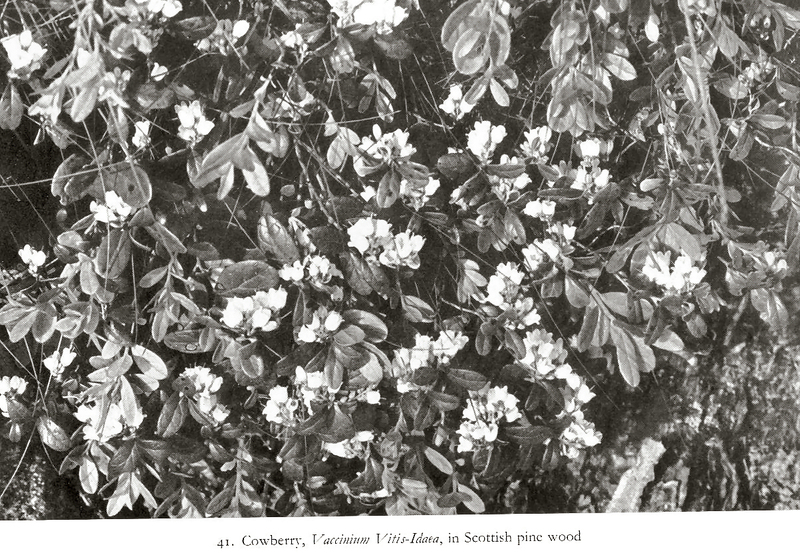 It is a very common plant in the Highlands, especially in places such as Speyside where large areas of sandy soil, brought down by ancient glaciers, are found. It is a tall shrub with a stout, woody, erect stem which branches at the summit. From the branches arise a large number of green, angular, slender twigs upon which the flowers and leaves are borne. The leaves are very small in proportion to the size of the plant. The lower ones are trifoliate and are covered with silky hairs on the under surface, whilst the upper ones are reduced to one narrow leaflet. This great reduction in leaf surface reduces transpiration to a minimum, but if the plant depended solely upon them for the manufacture of food substances, it would be unable to maintain itself. To supplement this deficiency the green twigs contain much chlorophyll in their outer tissues and it is they who carry out the main function of photosynthesis. They offer much less surface to the drying effect of wind and sun than leaves would do, this being an adaptation to the dry conditions which this plant faces. The large beautiful flowers are produced singly or in pairs in the axils of old leaves and form a long, leafy raceme. Owing to the smallness of the leaves, the plants seem to be a mass of flowers when in full bloom, and as they tend to form colonies, the effect is magnificent. The flowers are typical of the great Pea Family to which the Broom belongs and are constructed for pollination by bees. The five golden petals are arranged as follows; the upper one, or standard, is broad and erect and forms the main advertisement of the flower, and it is often marked with brown honey-guides; the two side petals, or wings, are ovate in form and produced back into a tiny claw, a depression occurring at the base of the petal near this claw; the two lower petals are united to form a boat-shaped structure, the keel, and near the base of each a tiny prominence occurs, which fits into the depression on each wing and forms a kind of hinge. The flower possesses ten stamens, five of which are longer than the others, their filaments being all united towards the base to form a closed sheath around the ovary. The ovary is long and narrow and is terminated by a very long, flexible style which is twisted spirally among the stamens. Both ovary and stamens are contained with the keel. A bee, visiting a newly-opened flower, alights upon the wings, which, being hinged to the keel, depress it, the short stamens springing out and dusting the underside of the bee with pollen. ON going to an older flower the pistil and longer stamens spring out and the hairy style, covered with pollen, deposit’s the precious dust upon the bee’s back. At the same time the stigma collects any pollen which the bee may have brought upon its back from another flower. If it has no transported pollen upon its back it does not matter as the style twists downwards to the position occupied by the anthers of the short stamens, and in that position, the stigma will collect pollen from the abdomen of the bee. It would be obvious to anyone that there is no contrivance to prevent pollen from the anthers falling upon the stigma during these movements and thus self-pollinating the flower. This, however, does not matter as it has been proved by experiment that the ovules cannot be fertilized by pollen from the stamens of the same flower, thus cross-pollination is imperative for the production of fertile seed. The flowers produce no nectar and are visited by bees solely for their abundant pollen. After fertilization the ovary lengthens and swells to form the characteristic pod or legume, typical of the family. On hot sunny days in August the pod splits explosively, throwing the seeds to a considerable distance from the parent plant. Thus we have another example of how marvelously plants have adapted themselves to the conditions of life in which they find themselves. The roots of this plant, as in the case of the clover, are also inhabited by bacteria, which aid the roots to obtain nitrogen, an element usually deficient in their sandy, stony habitat. Another common moorland plant, occurring at higher elevations than the broom, but often as abundant, is the Needle Whin, which also belongs to the Pea Family and, like the broom, is a xerphyte. It is a low growing, almost spreading shrub which does not grown to a greater height than that of the surrounding vegetation, and thus obtains shelter from the wind in its exposed habitat. The stems are slender and woody, and give rise to short, spiny branches in the lower part. The development of spines instead of leafy branches serves two purposes, one being that of cutting down excessive transpiration and other of protecting the main stems against the attacks of herbivorous animals. The upper branches are covered with small, narrow, smooth leaves which are not trifoliate. The low stature, reduction of the lower branches and the small leaves, are all adaptations to combat drought on the dry wind-swept moors. The flowers are produced in small, leafy racemes at the extremities of the upper branches, and are much smaller than those of the broom and of a much paler yellow. In the unopened flower the standard lies parallel to the wings and keel. This position, however, is one of the tension, the keel being retained in it by the union of its upper margins, which enclose and retain the curved pistil, which presses against them like a spring. Within the keep is found the ovary and the ten stamens, which are arranged in two whorls as in the broom, but in this plant the anthers shed their pollen into the tip of the keel. When a bee alights upon the flower, its weight depresses the wings and releases the tension in the keel, the stamens and pistil flying up, whilst the keel flies down throwing a shower of pollen over the insect. No nectar is secreted, the bees visiting the flowers for pollen only. This is a common plant on the moorlands and heaths up to 2,000 feet. The perennial stem is a short, decumbent stock which lies buried in the shallow humus throughout the winter, and in spring gives rise to stiff, erect stems. They are very slender and completely glabrous and produce leaves at fairly long intervals. The whole plant is remarkable for its very slender habit, ideally suited to withstand fierce winds. The leaves are heart-shaped in form and are opposite to one another, so that at first glance the stem appears to pass through the middle of a single, elliptical leaf. The leaves are marked with pellucid dots which are actually glands secreting essential oils, and they have a thick cuticle. These two factors help to reduce transpiration, for as the surface of the leaf becomes heated by the sun, the essential oils evaporate, thus reducing the temperature of the leaf, and hence the transpiration rate. The flower are produced on wiry, erect stalks from the axils of the upper leaves and forma a pyramidal panicle. The calyx consists of five broad sepals, which are united into a shallow cup, their edges being fringed by black, glandular hairs which act as a fence against crawling insects. The corolla is bright yellow in colour, and the five petals, which are much longer than the sepals, are not united but form a cup-shaped bloom. The flower appears to have a vast number of stamens, but upon careful dissection they will be found to be united into three bundles. The three-sided ovary occupies the centre of the flower and is surmounted by three long styles. The flowers are visited by bees, flies and beetles, which come for the abundant pollen, no nectar being secreted. Whilst tramping over the wind-swept moorlands and sandy heathlands in autumn, one must have been struck by the number of berry-bearing plants to be seen. The Whortleberry with its luscious purple-black fruit, the small bluish berries of the Crowberry, the red berries of the Bear-berry and the Cowberry, are examples of the wealth of fruit to be found. No wonder that so many grouse, blackcock and similar birds are able to thrive on the bleak Scottish moorlands. The Cowberry is perhaps the most handsome of the Vacciniums or Whortleberries. Its drooping, crowded racemes of pale, flesh-colored flowers, its erect stems covered by thick, shiny evergreen leaves and the mass of scarlet fruit which follows the flowers aid in making it attractive. It possesses a long, creeping, woody, underground stem which gives off creeping branches or runners, and it is thus able to colonize extensive areas. It is also an evergreen, as the soil is shaded by its leafy mantle, competitors find it difficult to enter or thrive in its territory. The leaves are rolled over at the edges to protect, in some measure the lower surface from the wind, and as they are thick, shiny and leathery, are well adapted to exposed dry conditions. On the under side, many brown dots may be seen; these are scales which help to cover the stomata and prevent excessive transpiration. The corolla is an open bell, the edges of which are not reflexed. Its stamens are constructed in a similar fashion to those of the Whortle-berry, the flowers being pollinated by means of bees and butterflies. The fruits are eaten by birds and the seeds pass uninjured through the stomach and intestines, to be dropped far from the parent plants, thus effectually increasing the Cowberry’s territory. 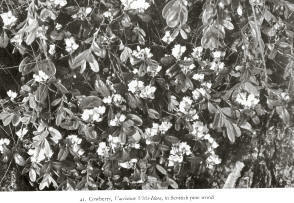 This is another common berry-bearing plant and also belongs to the Heath family. It is actually a carpet plant, its long trailing stems covering extensive areas, and it forms dense carpets of thick, leathery evergreen leaves. Its flowers are similar to those of the Cowberry and the stamens are constructed as in the Whortleberry, but they are followed by bright red berries. It is a very common plant on the sandy heathlands of Speyside, but may be met with on high moorlands up to 2,500 feet. This is a very rare plant, being found in a restricted area upon a moorland on the Sow of Athol, and it also belongs to the Heath family. It is a small, much branched shrub covered by many fine, evergreen leaves which are bordered by minute, glandular teeth. The fine leaves serve a similar purpose to those of those of the heather, as they reduce transpiration and offer little resistance to wind. Three or four slender erect stalks arise from the summits of the branches, and these each bear an umbel of flowers, which are very beautiful and of a purplish-blue colour, consisting of a bell-shaped corolla which bear five very short lobes. The flowers are fertilized as in the case of the Bell-Heather. The reason for its very restricted habitat will be explained in Chapter XXII. This plant is very common on moorlands, heathy pastures and roadsides, and could be quite easily taken for a Composite. It is a very showy plant with its large, hemispherical, deep blue heads of flowers. It obtains its name from the short rootstock which seems to have been bitten off short and then replaced in the soil. This rootstock lies dormant in the soil throughout the winter, and it is thus unlike the heaths and whortleberries which pass the winter largely above the ground. In spring the rootstock will be found to have given rise to a rosette of large, ovate, radical leaves on long stalks. By their flat, spreading habit, they are less exposed to the wind and prevent other plants from growing close to the plant. The leaves are smooth and are not toothed, but a few hairs sometimes occur upon them. From the rosette of leaves arises a tall stem which may attain two feet. It is usually clothed with one or two pairs of opposite leaves, much smaller than the radical one and often toothed. From the axils, tall stalks arise, terminated by a head of deep blue flowers. If we examine a head carefully, we shall find that it possesses an involucre as in the Composites. The involucre is formed of two or three rows of bracts which effectually protect the head, before the flowers open. Here the resemblance to a Composite head ceases, for we shall find that each little floret is contained in a tubular sheath known as the involucel. Each floret is thus a separate flower, but as we have seen reduction has gone so far in the Composites that the involucel does not exist. If the involucel be carefully removed from a floret, the calyx will be seen to consist of five rigid teeth surmounting the ovary. The corolla consists of a narrow tube with four, spreading, rounded lobes, one of which is larger than the other three. The four stamens arise from the sides of the corolla tube and project well beyond it, their reddish-brown anthers contrasting agreeably with the purplish-blue flowers. The style is very long and projects well beyond the ring of anthers. Nectar is secreted at the base of the corolla tube and is eagerly sought by many kinds of butterflies, who are the flowers chief benefactors. The protruding stigma must be touched before the anthers, so that cross-pollination is assured. The fact that many florets are massed into a single compact head means that one insect can visit and pollinate several flowers in a short time. Several species of Composites occur upon the moorlands, one of the commonest species being the Mountain Everlasting (Antennaria dioica), which is related to the beautiful Edelweiss of the Swiss mountains. It possesses tufted stems which often give rise to creeping runners, the stems and runners being clothed with oblong leaves which are covered by a dense coat of cottony hairs and felt which gives them a whitish appearance. This is a device to reduce transpiration and enables the plant to thrive in dry, exposed places. It is rather remarkable among Composites in producing the male and female flowers on separate plants. The involucre, like the leaf and stems, is covered in dense cottony hairs and the inner bracts have broad petal-like tips which spread outwards, like the ray petals of a daisy; these are the advertising agents as the florets themselves are inconspicuous, tubular and short. In the females the spreading bracts are missing, but the corollas are very fine and protrude, giving the head a snow-white effect and thus making them conspicuous. After pollination (and owing to the separation of the sexes only cross-pollination is possible) the floret produces a long hairy pappus, which supports the seed and aids its distribution. Another common Composite is the Wood Cudweed (Gnaphalium sylvaticum), which Is related to the preceeding. It is also a perennial and its erect stems are clothed by long, narrow leaves which are covered by a short, grayish felt, which gives protection against exposure. The flower heads are very small and produced on a long, leafy spike, the bracts of the involucre being a bright, shiny brown, whilst the outer florets of the heads are filiform, the inner ones being tubular. After fertilization they produce a white, silky pappus and , in their wind-swept habitat, the parachute seeds travel long distances. Thus the Wood Cudweed is a common and well distributed plant. One of the finest tramps in the Highlands is that from Aviemore, through beautiful Rothiemurchus Forest and the Larig Ghu Pass to Braemar. As one climbs out of the forest, one must have been struck by the grandeur of the scenery. Cairngorm, with its wild corries, looms up to the left, and Braeriach stands grand and solemn to the right of the deep savage cleft, which is the Larig Ghru. Heather-clad moors, sweep up to the pass from the forest, and as one toils upwards over stony paths and bogs the ptarmigan glide, with a whirr of wings, almost from beneath one’s feet, and the deer bound away to safety. It was here in the sanctuary of the mountains that I first found the Dwarf Cornel. This is a strange little plant, whose only other relation in Britain is the shrubby Dogwood so common on chalky hills in the south. It is a herbaceous plant, fairly well distributed over moorland areas of the Highlands, its relationship to a family of woody plants being shown by the main perennial stem is a creeping, woody rhizome buried in the moss and soil. The Dwarf Cornel is, therefore, a dwarf tree or shrub whose trunk is buried in the ground and whose leafy branches only appear above the surface. The erect, annual stems are about six inches high and die down in the autumn, and are clothed by a few pairs of opposite, ovate, smooth, entire leaves with five to seven conspicuous white veins running up the leaf. The stems are terminated by an umbel of small flowers. On first seeing the plant, one could fall into the quite excusable error of thinking that each stem gives rise to a single flower. If we examined the apparent flower, we should notice four large whitish spreading objects tipped with purple, which look like petals. These, however, are bracts, the actual flowers being the small dark purple objects in the middle of the bracts. In this plant, as in the Mountain Everlasting, the bracts are the advertising agents which attract insects to the actual flowers. The flowers themselves are tiny purple cups with four small projecting stamens and a projecting stigma, and as they secrete nectar they are visited by bees and flies. After fertilization the ovaries swell to form bright red berries, and it is thus yet another moorland plant which obtains distribution of its seeds, by attracting birds with its bright fruits. The Dwarf Cornel may be found up to 3,000 feet in the Highlands and is rare below 1,000 feet. It thus belongs to the special flora of the Scottish mountains. This is a small plant with weak, prostrate stems, but it is usually quite conspicuous in spite of its small size as it forms considerable colonies, and is common on dry moorlands and heaths. The stems are clothed in whorls of narrow leaves, about six leaves being produced in each whorl, each one being terminated by a short, awl-like point and fringed with tiny forward-pointing prickles. The flowers, which are very small and white, are produced in dense cymes and collectively are fairly conspicuous. Each tiny flower possesses four spreading petals, four erect stamens and two erect styles, and as the produce nectar and are sweet smelling, are visited by butterflies and small flies. The fruit is a tiny burr containing two seeds, which attaches itself to the fur of animals, the seeds being thus distributed far from the parent plant.